Jesus, I do not know the complexities of our laws’ surrounding the Dakota. 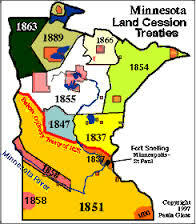 I can see, with my limited vision and knowledge, that the Federal government with the state government of Minnesota as beneficiary, had a motive to acquire and to redistribute more land from them. This could be a non-issue, were it an amiable deal with a complete and clear understanding of terms. However, I see the phrases here “are pressured” and “forced to sell”. A forced sale is not a sale, but coercion or extortion. Again, who would choose to submit to high pressure sales tactics of their own volition? Will You forgive this offense of coercion towards these 26 Dakota leaders and all their people and lands? We have offended You by offending these exact Dakota bands? Will You forgive us this debt officially done in the name of Minnesota and our Federal government? Will You lift the spirit of coercion that still binds this specific Dakota land? Will You lift the spirit of harassment from the shoulders of these 26 Dakota representatives, their nation, and all their generations? Will You free our government and it’s Representatives from the bondages incurred through this event? Will You create remorse that leads to right relationship in those who specifically forced this “sale”, and their figurative children today? With President Abraham Lincoln, today I pray for “a new birth of freedom”! Will you inspire us to create new means to legally restore such historic cases? Furthermore, will You teach us ways to unravel the generational damages to our bodies’, minds’, wills’, emotions’, and physical environments? Good Father, how I love Your freedom! You do not force us to follow You, but have said, “Choose this day who you will serve.” (Joshua 24:16) May we forever cherish the Messiah’s example of laying down His life for both friend and enemy! He blessed those that cursed Him even during His execution!? May we consciously choose to love our neighbor! May we seek Your blessing, and the double blessing of our neighbors!